2. The cell membrane contains ____________________molecules that are embedded in the lipid bilayer. 7. One of the most important functions of the cell membrane is to __________________ the movement of dissolved ________________________ from the liquid on one side of the membrane to the liquid on the other. 8. A solution is a ________________________ of two or more substances. 11. Diffusion depends on ____________________ particle movements, therefore it [ does | does not ] (circle) require energy. 15. Because cells are hypertonic in relation to fresh water, ___________________________ produces a net movement of water into the cell. 17. 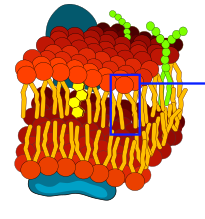 Cell membranes have _________________________ that make it easy for certain molecules to cross the membrane. 19. Active transport moves molecules [ with | against ] the concentration gradient. 21. Changes in protein shape seem to play an important role in the ______________ process. 2. Which process always involves the movement of materials from inside the cell to outside the cell?